Cash Mob= People who assemble at a local business to spend money and make purchases in support of that business and community. The goal of this campaign is to reward forward-thinking businesses that value diversity and inclusion, and employ people with disabilities in meaningful, paid roles. We hope to inspire other employers to consider hiring inclusively. It’s EASY! Show up at the selected employer cash mob location on the right date at the right time and spend some money! Your contribution (little or big) will help demonstrate our support towards inclusive hiring. This is a great opportunity to come do some last minute Halloween shopping! Disability Employment Awareness Month (DEAM) is an annual awareness campaign that takes place each October. The purpose of DEAM is to promote employment inclusion for people with disabilities and celebrate the many and varied contributions of workers with disabilities. 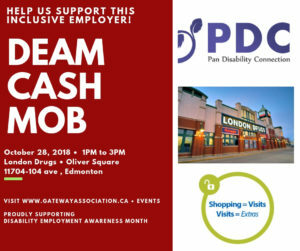 DEAM, is gaining traction in Canada with a growing number of provinces proclaiming October as Disability Employment Month. We want to spread the important message that a strong workforce is one inclusive of the skills and talents of all individuals, including people with disabilities. DEAM is an excellent opportunity for Employment Service Providers and Canadian Employers to demonstrate their ongoing commitment to Canadians with disabilities and to help promote employment inclusion in our country. The Month of October will be Proclaimed DEAM! Celebrate With Us! We want to spread the important message that a strong workforce is one inclusive of the skills and talents of everyone, including individuals with disabilities. We are holding a public celebration to support the Launch of DEAM. Better yet! 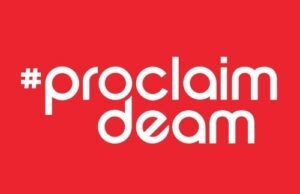 We have a limited number of #proclaimDEAM T-shirts available for purchase for the reasonable cost of $10. Contact us today!